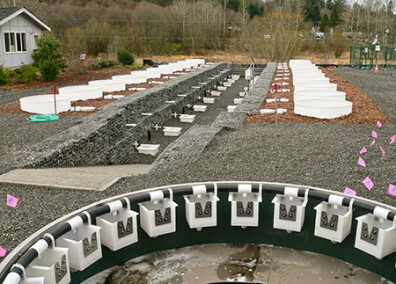 The Stormwater Center got its start based in part on the expertise and research of John Stark, the director of the WSU Puyallup Research and Extension Center. Dr. Stark, an accomplished ecotoxicologist, began serving on the science panel of the Puget Sound Partnership when it was launched in 2007 by renowned environmental leader Bill Ruckelshaus. The panel was tasked with providing the expertise and advice to develop a comprehensive, science-based plan to restore the Puget Sound. In that first year, the panel identified stormwater as a major point of concern for the ecological health of the Puget Sound. Stormwater is most problematic in urban areas with a prevalence of paved surfaces and a lack of green infrastructure like rain gardens that can filter and slow water before it reaches Puget Sound. The impact of stormwater has been on the EPA’s radar since the 1990s. With the region’s growth and development in the last two decades it is now the number one source of pollution for Puget Sound. Stormwater pollution is a significant threat to the salmon, orcas, and shellfish populations that call the marine waters home. John Stark and his colleagues at the WSU Research and Extension Center (REC) in Puyallup have the expertise and resources to help solve the problem. Reducing the impact of stormwater requires research to develop new ways to remove pollutants before they reach bodies of water, and outreach to encourage businesses, cities and homeowners to adopt new practices. Doing so depends on collaboration between those stakeholders, and the governing bodies tasked with ensuring environmental health through regulation and permitting. The WSU REC in Puyallup conducts research – with long-standing programs in aquatic health, low impact drainage options, and filtration – and has the capacity through Extension to provide training in best management practices. So when stakeholders asked for a neutral, third-party group with the expertise to help navigate the complexities of stormwater management in 2009, WSU was a natural fit. Dr. Stark, along with assistant director Tanyalee Erwin, and others at the WSU REC in Puyallup developed the Washington Stormwater Center with partners at the UW Tacoma Center for Urban Waters. The Stormwater Center is primarily housed at the WSU REC in Puyallup. Dr. Stark has been acting director since it launched in 2010. In six years, the center’s research has revealed how toxic stormwater is for aquatic life, particularly salmon, and identified viable ways to remove pollutants from the water. The outreach and training program for businesses and municipalities who need to comply with stormwater regulations successfully provided a wide range of educational resources from conferences to video trainings. The success of the center has attracted crucial support from stakeholders who benefit from the development of new solutions, and those who seek to advance sustainability efforts. The Boeing Company, for example, has been a significant supporter of the Stormwater Center from the beginning – providing funding and sometimes materials for research like the recent project on permeable pavement that incorporates carbon fiber composites. “It is a win-win for both sides,” Stark said, “Boeing’s support and donation of materials allows us to explore and develop new options that will eventually help Boeing incorporate new practices that will protect water resources for our state and the Northwest,” Stark said. The Bullitt Foundation and the Russell Family Foundation have also provided critical support for the WSU Puyallup Research and Extension Center programs that address pollution for years. 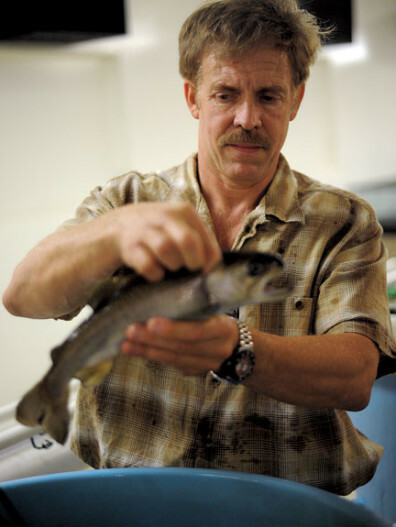 For example, Russell Family funding allowed researchers to demonstrate the value of low-impact development (LID) for the survival of aquatic species. Support from the Bullitt Foundation has also allowed the center to provide LID training programs for years. LID is now one of the main staples of the Washington Stormwater Center, which provides resources and trainings to those interested in implementing this technique to reduce stormwater impact. More recently, working with WSU’s Office of Foundation Relations, Boeing, the Bullitt Foundation and the Russell Family Foundation joined together to co-fund the center’s long-range business planning and leadership efforts. Moving forward the center plans to expand research to learn more about the impact of pollution on aquatic life beyond salmon such as shellfish, as well as bringing in new partners to keep learning and addressing different impacts of stormwater. If you are interested in learning more or partnering with the Washington Stormwater Center, please join us to learn about cutting edge research conducted by WSU aquatic ecotoxicologist, Dr, Jen McIntyre, at the WSU Innovators event on April 12, 2016 in Seattle. Registration will open March 1 at innovators.wsu.edu.